PETALING JAYA: Exorbitantly high selling prices, stringent banking rules and a generally cautious sentiment that has been having an impact on the Malaysian property market this year could continue into 2013. Malaysian Institute of Estate Agents (MIEA) deputy president Siva Shanker said property transactions in the first half of 2012 had slowed down, adding that this trend showed no signs of abating any time soon. “Asking prices are too high. The buying frenzy is over. In 2010 and 2011, some residential sectors saw an increase of about 30%, which is way too high and moving towards a bubble. This trend has somewhat plateaued. “What's happening now is there is no meeting of minds between the asking and the accepting price. The gap is just too wide and there are fewer transactions taking place,” he told StarBiz. Siva also said transactions had been affected because there was a disparity between the asking price of the property and the actual price listed on the valuation report. “For example, the asking price of a property is RM1mil but the valuation amount might only be RM800,000. There's a shortfall of RM200,000 and banks lend you money based on either the selling price or the valuation price whichever is the lower. “So if the valuation price is RM800,000 and you're eligible for a 70% loan based on that amount, you get a sum of around RM560,000. This means the buyer is going to have to top up RM460,000 on his own! Siva said a number of sales this year had been aborted because of this issue. “We don't think 2013 is going to be much different, but we don't see the Malaysian property market crashing and burning like during the US subprime crisis. Siva said Bank Negara's responsible lending guidelines that were implemented this year also had an impact on the Malaysian property market. Effective Jan 1, banks have been using net income instead of gross income to calculate the debt service ratio for loans. This is said to be a pre-emptive move by the central bank to contain the rise in consumer debt. “Prudent lending guidelines are important in maintaining a stable economy, but I think some flexibility must be allowed for individual purchasers that have the capacity to repay their loan, but for whatever reasons, are unable to show that they can,” said Siva. He also noted that there were many individuals having side incomes which were not declared. “You could be a teacher earning a RM3,000 salary. However, you could be providing tuition classes on the side to earn extra income but can only show to the bank the salary that you earn. 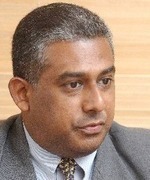 Siva also said the Malaysian public was cautious in light of the global economic uncertainties. "Sustainability has been foremost in our plans every step of the way. We want to push the envelope in green development in Malaysia. This world-class recognition reflects our commitment to a green future," 1MDB Real Estate Sdn Bhd Chief Executive Officer Datuk Azmar Talib said in a statement. This puts TRX on the penultimate stage of being pre-certified. KUALA LUMPUR: Malaysians are the fourth largest group of buyers when it comes to snapping up residential properties in Australia. Jalin Realty International chief executive officer Ian Chen said the figures are derived from the Foreign Investment Review Board, a non-statutory body that advises the Australian government on foreign investment policy and its administration. "In the 2010-2011 period, Malaysia was in fourth position with a total of RM1.863 billion spent on properties in various parts of Australia. The top three countries were Britain, China and the United States," he said in an interview with the Business Times recently. 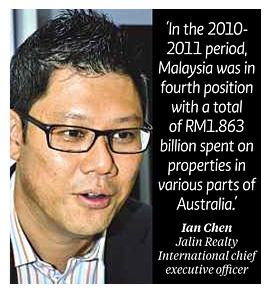 Jalin, a company set up by Chen's father in Malaysia 30 years ago, specialises in promoting Australian properties, mainly in Melbourne and Sydney, to buyers in countries like China, Jakarta, Singapore, Brunei and Malaysia. "Most of our clients are from Singapore, followed by Malaysia. In Singapore, most of our clients are professionals while in Malaysia, they are mostly businessmen," he said. Chen said most of the Malaysians who buy properties in Australia do so for investment purposes, while some buy them for their children who are there to further their studies. He said the returns are very good and command a yield of between four and five per cent a year. "The demand is expected to remain higher than the supply," he added. "We are planning to expand our expertise to India next year as it has the most number of immigrants to Australia as of now," he said. Chen said the company is also looking at developing its own properties in Melbourne. "We will be working with Australia's Lechte Corp for an upcoming project, which will be known as Forest Hill," he said. The gross development value for the project is RM320 million. He said the project will comprise 164 apartments and 17 townhouses. "We are also looking at another project in Sydney," he added. NUSA Gapurna Sdn Bhd, a low-key developer, is mul-ling grouping its assets to form a commercial real estate investment trust (REIT) by 2015, which could potentially be worth more than RM2.5 billion. It is understood the assets will include the six high-rise buildings that are being planned at PJ Sentral Garden City, a project by PJ Sentral Development Sdn Bhd. PJ Sentral is a 70:30 joint venture between Nusa Gapurna Development Sdn Bhd (NGDSB) and the Selangor Economic Development Corp (PKNS). Nusa Gapurna, controlled by Datuk Mohd Salim Fateh Din and his associates including Tan Sri Abdul Halim Ali, owns 60 per cent of NGDSB. The remaining stake in NGDSB is held by the Employees Provident Fund (EPF). The construction of PJ Sentral Garden City located behind PJ Hilton Hotel will take seven to eight years beginning at the end of next year. Business Times understands that it will comprise five custom-built office towers, each ranging from 20 to 45 floors, with estimated gross development value of RM2.6 billion. The project will also include a five-star hotel, a 7,000 car park complex, a 1.6ha public park and a supportive retail element for food and beverage. Sources familiar with the matter said that Nusa Gapurna is planning two business strategies for the assets. "The first strategy is to form its own REIT, which is the primary option. It is more ideal because the company has ready tenants to give it good yield income. Financial advisers have been engaged for the matter," a source said. The source said the second strategy is to sell the towers block by block to REIT managers or institutional investors with ready tenants. According to the source, Nusa Gapurna is in negotiations with local public listed companies and corporate players to lease the buildings for a period of between 10 and 15 years. "The company is finalising the design of the buildings with the anchor tenants. Construction will commence next year after getting all the necessary building approvals. Once these are settled, Nusa Gapurna will finalise the formation of the REIT," the source said. The source said PJ Sentral Garden City will be built according to Multimedia Super Corridor Malaysia and Green Building Index specifications.